A while back I did a post on this and you can find it in the side-bar under RA-articles. In case I missed something, here is some additional information. Pineapples are from origin native American plants, but became widespread through the tropics by sailors, who planted them wherever they landed, because the fruit contained the vitamin C to prevent sailor's scurvy. 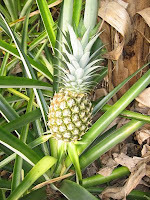 Group of enzymes found in pine­apple that break down protein. Capsules and tablets; take 500 mg to 2,000 mg three times a day between meals. Decreases pain and swelling of rheu­ma­toid arthritis (RA) and OA, and increases mobility. There is some evidence that enzymes like bromelain have pain-relieving and anti-inflammatory effects comparable to NSAIDs. A 2005 study done in Germany showed that bromelain activated immune cells that fight infection. Bromelain can cause stomach upset and diarrhea and should be avoided if you are allergic to pineapples. It can also increase the effect of blood-thinning medicine. It can be eaten plain but also mixed in with a salad. Canned fruit is great for baking, but don't use it with gelatin, because the enzymes keep it from setting. It is a great meat tenderizer and adds flavor to marinades. It is simple to grow it yourself. Place the cut-off top with the leaves in a bowl of water and it will root within a few weeks. You can then plant it in the yard, or a pot and grow your own fruit. Remarkable, how quick and easy it roots. The results are seen in no time. The same goes for our words. They have an immediate effect and can be ingrained quickly. So we better make sure the words we utter are true and yield good fruit.
" I create the fruit of the lips: Peace, peace to him who is far off and to him who is near," Says the LORD, " And I will heal him." We are so grateful for the good report on your Mom. God bless y'all. I am not quite sure, but you can't go wrong bringing them in for the winter. Good educational material as well for the boys to see how it grows, grin. Give those little rascals a hug from me! Blessings to y'all.